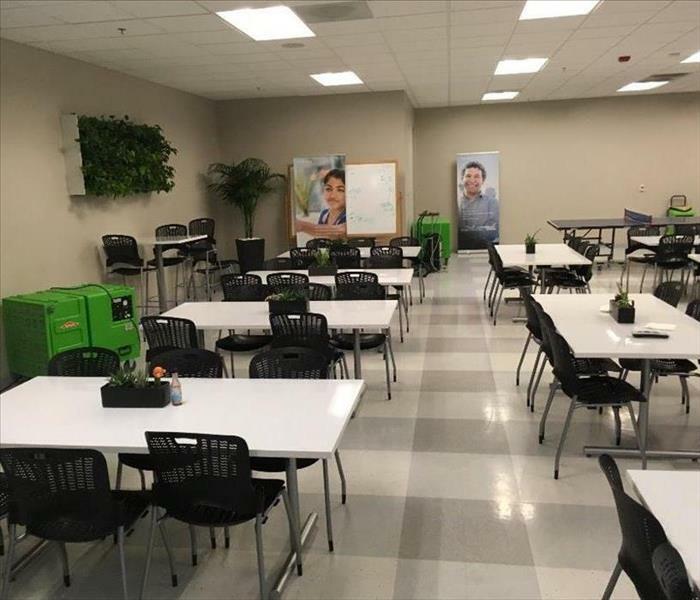 From small restaurants to large corporation break rooms, at SERVPRO of Palo Alto, we specialize in restoring restaurants, kitchen, break rooms and other food service facilities. Our professionals are trained to treat any environment while following all health codes and food safety regulations. Let us help you get back to business in the least time possible. We provide odor removal, facilities cleaning or restoration, and much more! Call us today for a quote at (650) 771-9715! 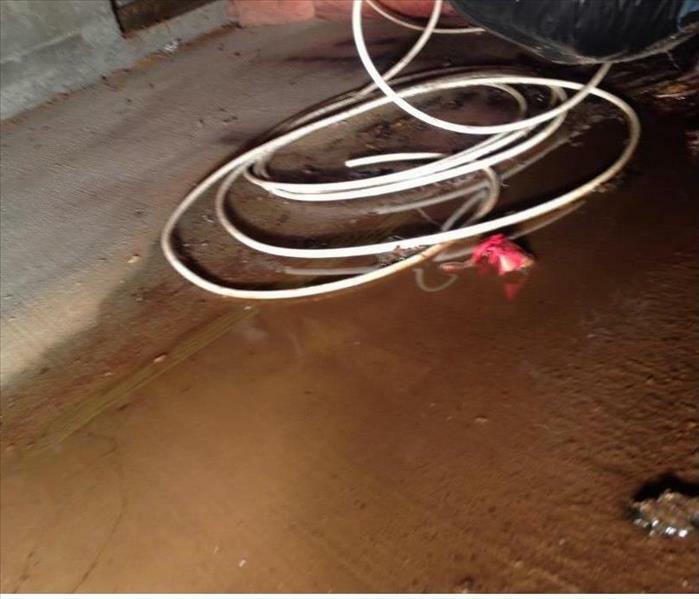 Water may enter the crawl space of your home in various ways. Some reasons may include a water line leakage, sewer drains, or rain water entering from a damaged structure. A wet crawl space can create multiple problems that may compromise the structure of you home, creating extensive damage that may become costly. 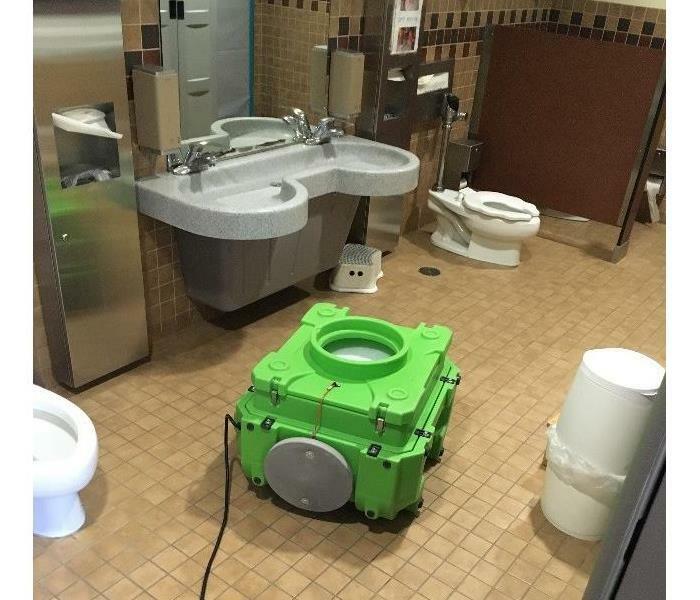 At SERVPRO of Palo Alto, we make sure that these spaces are never missed and are handled properly. We may need to extract standing water, remove wet insulation, install equipment, and/or perform odor removal methods such as ozone or thermal fog. Our highly trained technicians will walk you through the appropriate steps to restore your home or business. For any questions regarding any of our services, please don’t hesitate to call us at (650) 800-3448. We all know how expensive replacing hardwood floors can be. After a water damage event, it is critical to dry out the floor completely in order to prevent them from buckling or retaining moisture that can lead to mold growth. 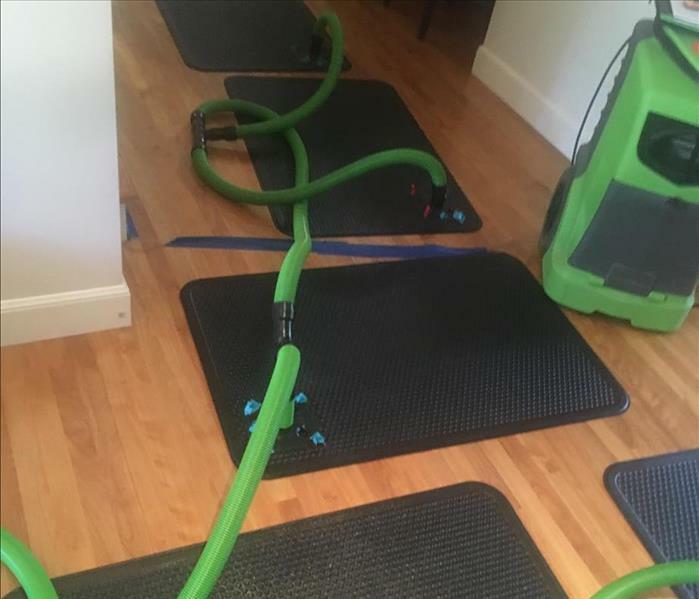 At SERVPRO, we use specialty drying equipment such as this floor drying mat system that creates a vacuum method that captures moisture from wet hardwood floors, effectively drying them in attempt to save the flooring. Trust your hardwood floors to the experts that care. At SERVPRO of Palo Alto, it is our goal to save you time and money. Reach us 24/7 at (650) 800-3448. Our Heroes Do Not Wear Capes, But They Do Wear Suits! At SERVPRO of Palo Alto, we understand that every hour spent cleaning up is an hour of lost revenue and productivity for your business. SERVPRO of Palo Alto will make sure to have the right equipment and technicians to complete the job in the shortest amount of time and deliver high quality service. Whether your business has been devastated by a fire, a water loss, or needs HVAC or deep cleaning, we will work with you so that your business has minimal to no interruptions when possible. Consider us on your next project and see for yourself! An electrical fire that started in one of these department stores, caused smoke to spread into multiple businesses through the ventilation system that connects all properties. 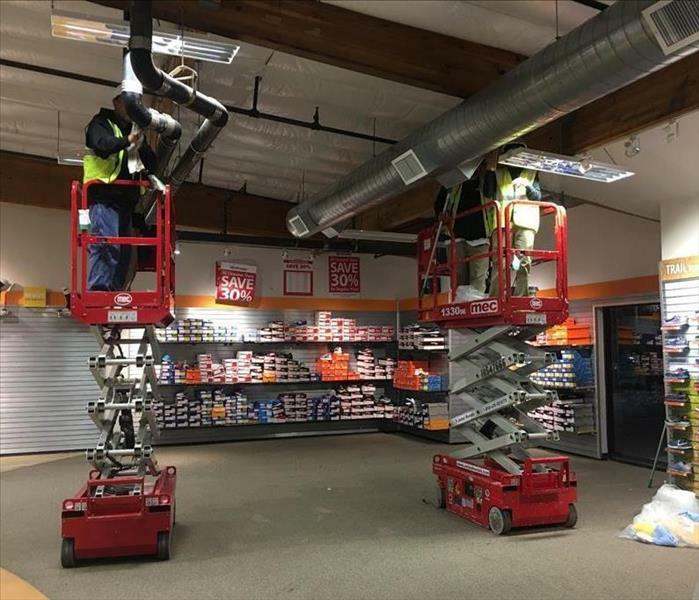 SERVPRO of Palo Alto was trusted in the cleanup and restoration of all four commercial buildings. Our trailer was equipped with tools, products, and specialized equipment to remediate the damages and begin the restoration process immediately. At SERVPRO of Palo Alto, we will make sure to have your businesses operating in the least time possible! Reach us at (650) 800-3448. This is what mornings look like at SERVPRO of Palo Alto: Our vehicles equipped and ready to head out to fix any property damages. No job is too big or too small for our experienced technicians. At SERVPRO of Palo Alto, we appreciate each and every one of our customers and value the trust they have placed in us. This department store in Redwood City was devastated by fire caused by a faulty electrical outlet. Heavy smoke filled up the warehouse causing major damage to the structure and its expensive contents. 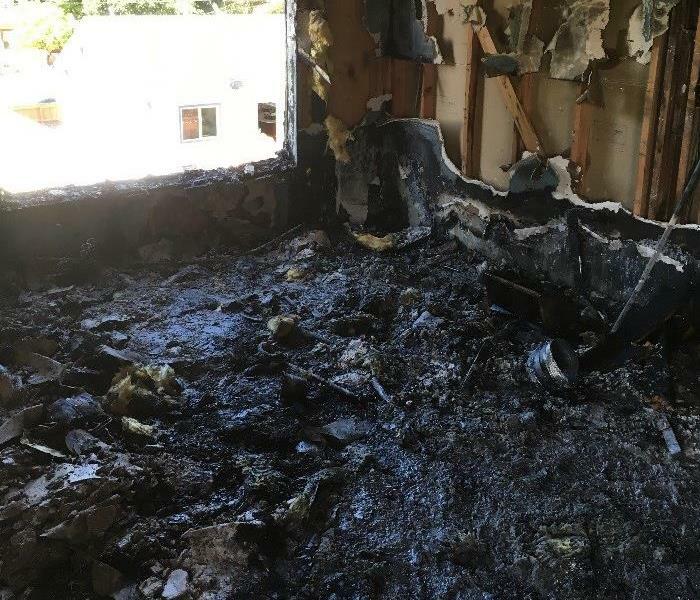 At SERVPRO of Palo Alto, we understand the importance of restoring the property as quickly and effectively as possible to reduce the financial burden caused by such fires. Don’t hesitate to call us at (650) 800-3448. We will have you back in business in the least time possible! A busy Palo Alto restaurant requested our professionals to assist in the cleanup of their basement kitchen. The owner wanted us to prepare it for future remodeling. Our cleaning crew suited up and began the process using our most effective products and techniques to remove grease and residue. The entire kitchen, including appliances were cleaned and sanitized thoroughly. SERVPRO Professionals Ready to Serve You! Our crew will not leave a work site until the customer is completely satisfied with the work provided. Our customers’ satisfaction is the main priority to all of us at SERVPRO of Palo Alto. We provide 24/7 emergency services and will respond immediately to any water or fire restoration situation. Don’t hesitate to call us at (650) 800-3448. This commercial building suffered a major water damage that affected several floors of the building. The carpeting and padding were destroyed, and the subfloor was saturated with water. We pulled out the carpet and padding and discarded it properly. Our SERVPRO technicians suctioned the subfloor, and set up commercial air movers and dehumidifiers to help with the drying process. The damage went from water to mold infestations and damage in less than 24 hours. SERVPRO treated the area for mold accordingly. SERVPRO of Palo Alto responded to an emergency call from a local school in Redwood City. A pipe had burst, causing major water damage in the hallways and several classrooms. 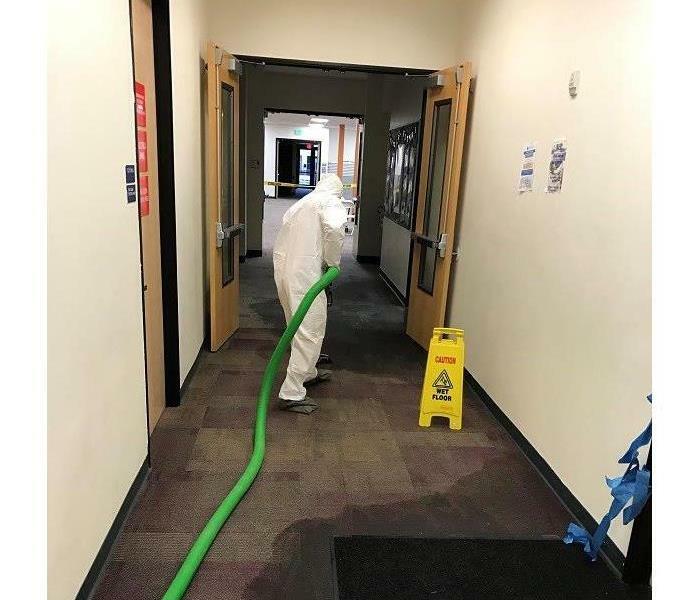 We responded immediately to extract water from the flooring and to dry the walls in order to prevent mold from forming, which could cause a hazardous environment for students. We worked tirelessly in order to extract the water as quickly as possible using our truck-mount and portable extractors, as well as humidifiers and deodorization equipment. We restored the school back to a healthy environment for the staff and students. 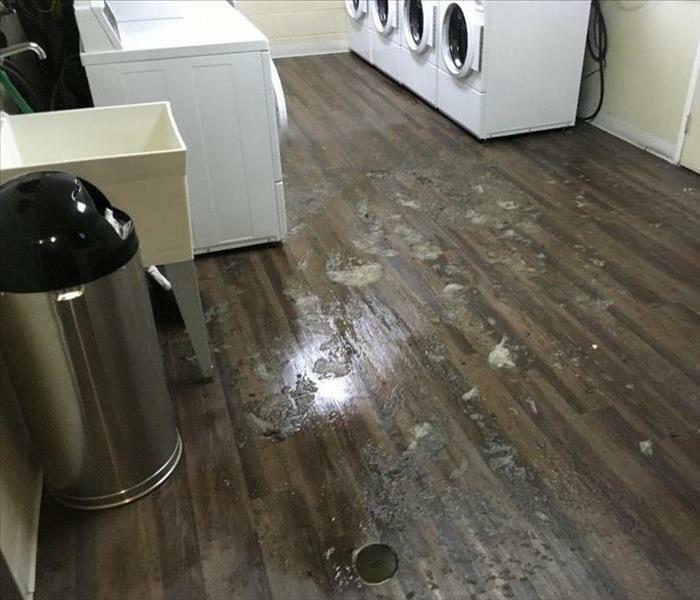 This owner of this apartment complex in Redwood City reached out to SERVPRO of Palo Alto after the laundry room had been affected by a water damage from one of the washer machines. Our SERVPRO technicians removed all the water and began the extensive cleaning and disinfection of the room. Drying equipment and air scrubbers were in place here to ensure that a dry, healthful condition is restored for the residents of this apartment complex. Public restrooms are commonly known to create water damage in buildings, requiring water restoration. 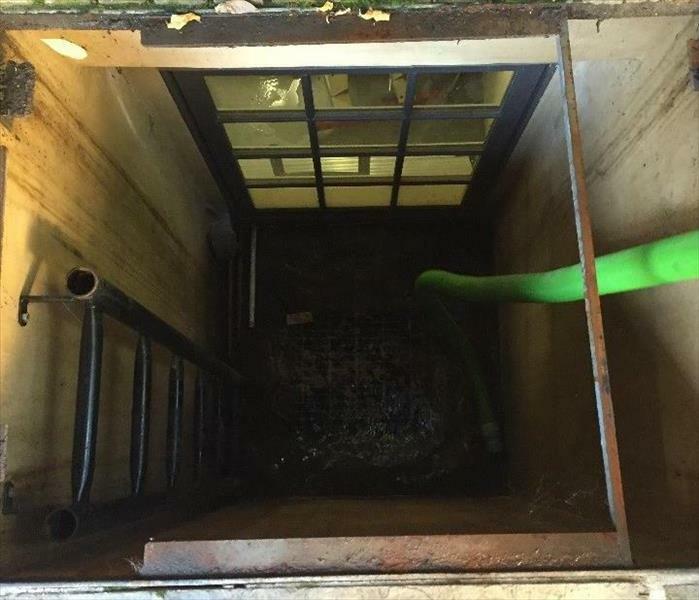 Sewage backup created a mess in this building in Atherton. It was inconvenient for the business owner, since it was the only available restroom. Our team of experts quickly gathered the necessary equipment and cleaning products to attend to the water damage. Floors and walls were not affected. The damage required water extraction and sanitation of the restroom from top to bottom. No matter the size of the disaster, SERVPRO of Palo Alto will be there to clean it up! When storms hit, water can accumulate in different parts of your home. In this case, this customer had rain water outside the property. When a storm or flood hits your home or business, and you need help immediately, our highly trained water restoration technicians are available 24-7. SERVPRO of Palo Alto is prepared with the proper equipment, experience, and specialized restoration techniques to get the job right. 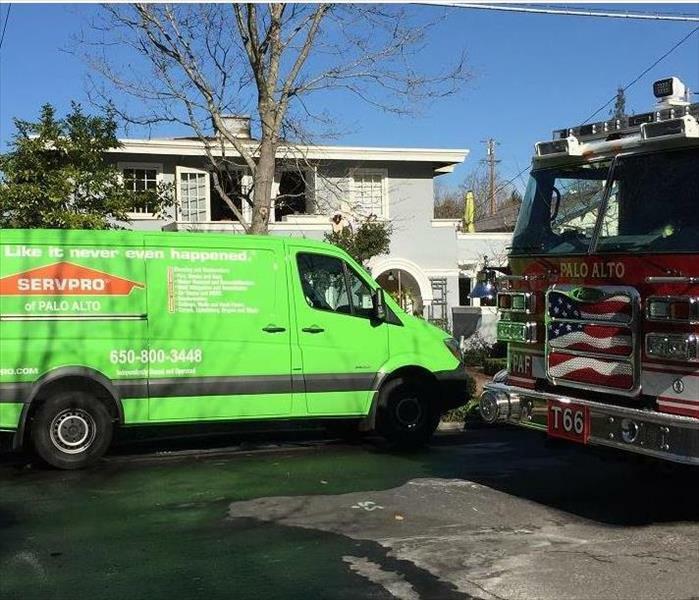 When a community fire occurred, SERVPRO of Palo Alto received a call by a homeowner who trusted our 24-hour emergency response service. SERVPRO of Palo Alto was on the scene before firefighters had a chance to clear the street. When a fire strike, fast response is critical to prevent secondary damage to reduce the cost. SERVPRO of Palo Alto responds immediately, day or night. A home fire can be a very traumatic experience for people. 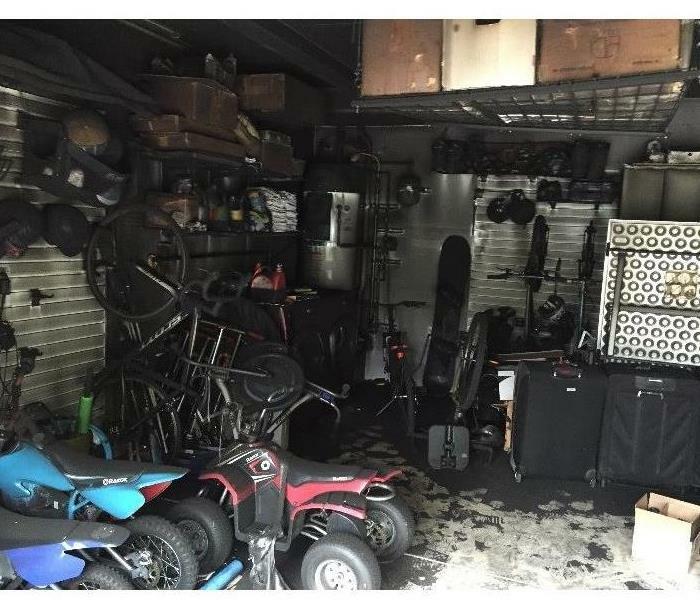 This family thought they had lost most of their valuables in their garage after a massive fire in the home. The smoke and soot had taken on their property. The family reached out to SERVPRO of Palo Alto for help. We loaded our SERVPRO vehicles with our state-of-the-art equipment to begin the drying and cleaning process as soon as possible. SERVPRO of Palo Alto specialists restored most of the valuables that they had believed to be lost forever. 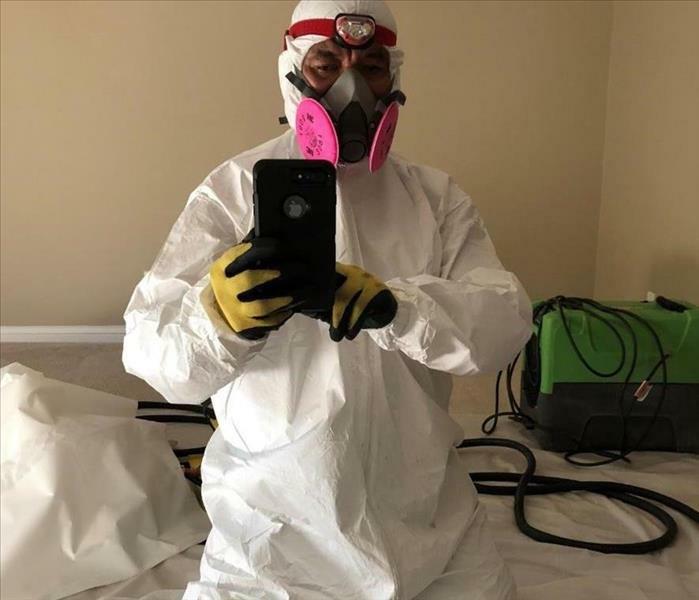 Pictured is one of our restoration heroes suited up with top quality equipment, products, and expertise ready to clean up a water damage event caused by sewage backup in a commercial building. With our IICRC and Employee Certified Training Program, our technicians can restore any fire, water, or mold damaging event in your home or business. Do not wait to call us at (650) 800-3448. 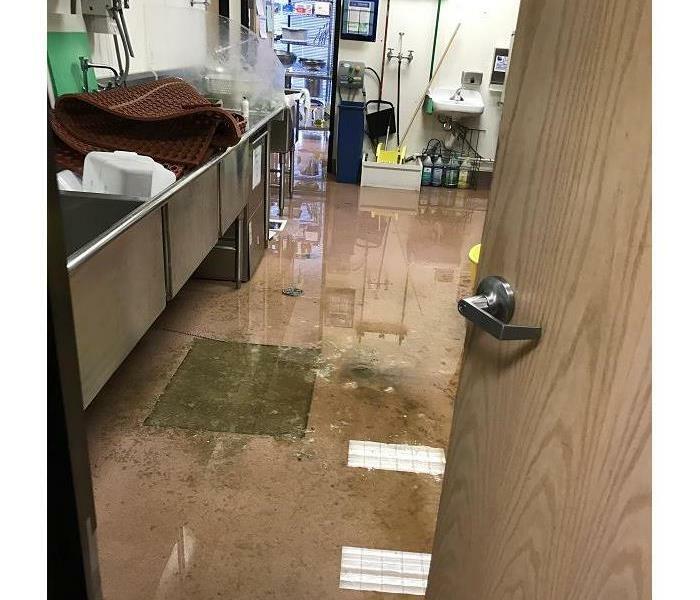 Flood Damage to this local large scale commercial building resulted in unsanitary black water that affected both the structure and the building contents. 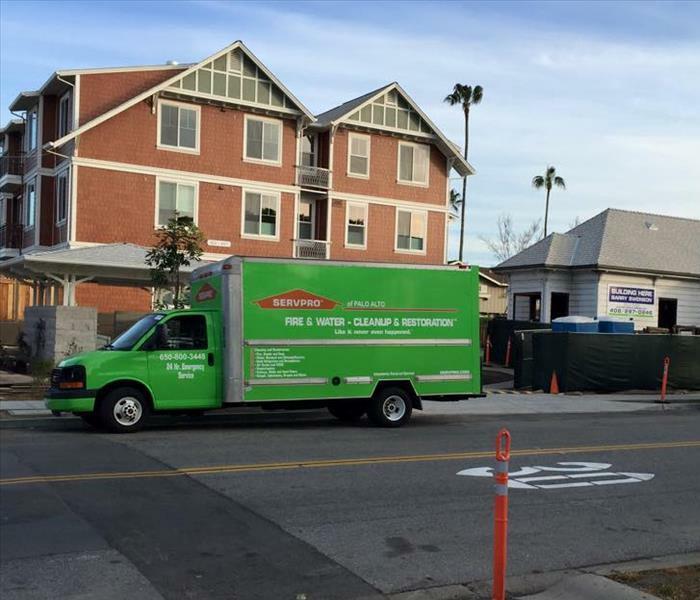 Once SERVPRO of Palo Alto was called, we responded immediately to the emergency situation and started the water extraction and clean-up process. Our highly trained specialists used the appropriate gear and protection to treat the area safely. The process involved the use of commercial grade pumps and water extraction equipment. During the heavy clean-up and disinfection process, generators, air movers, dehumidifiers, and large scale, truck-mounted drying systems were put into place to prepare the building to be back in business. Our Chevy Express 1500 is a Work Horse! 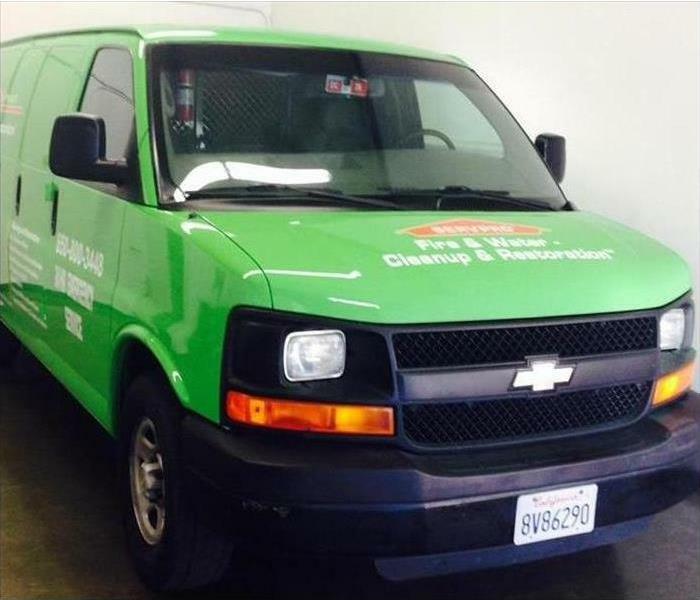 SERVPRO of Palo Alto is happy to add another vehicle to our fleet. This green beauty is a Chevy Express that is stocked and ready for us to respond faster than anyone to your fire or water damage emergency, or mold removal. It is also equipped with a great backup camera--because we always think of safety first! Our Brand New Sprinters Will Soon Be Green! 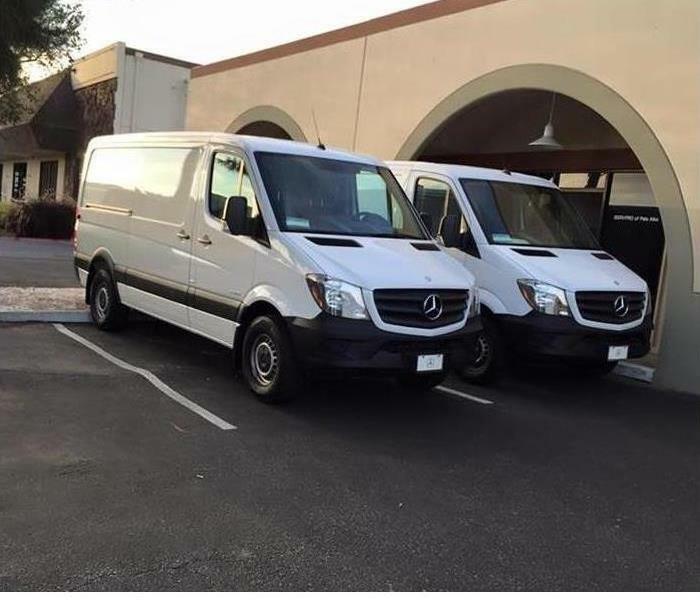 Our new additions to our fleet, brand new MB Sprinter 2500s. We are very excited about our new vehicles because we need them! Sometimes we are at capacity with our crews out and we need to respond to you FAST. Stay tuned to the van makeovers. We are ready to respond to your fire, water, and mold damage restoration services 24/7. Call us TODAY! A grease fire devastated this home in East Palo Alto. This photo shows how destructive the fire was and the extent of the fire damage. Our SERVPRO specialists handled the situation immediately, giving the customer peace of mind after such tragedy. The process required tear out and removal of large amounts of fire and smoke damaged building materials and debris. 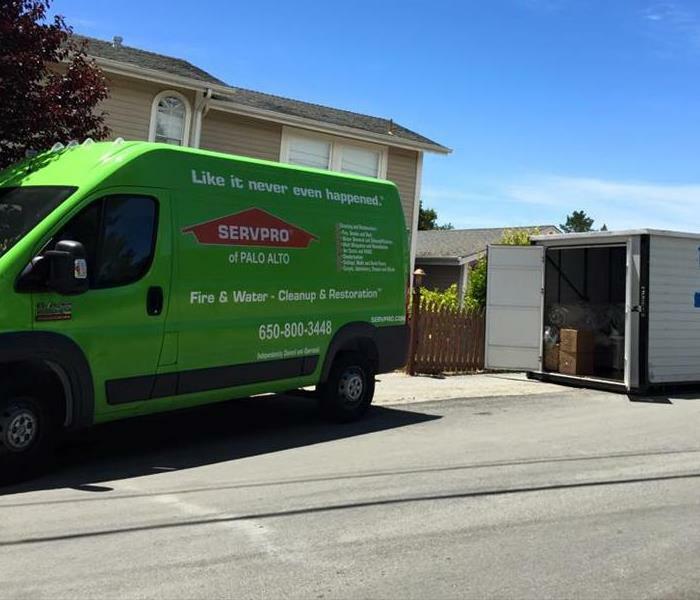 SERVPRO of Palo Alto follows all state and city regulations of removal and disposal of materials. In an event of a fire, you need a company that you can trust for your fire damage restorations. SERVPRO of Palo Alto had the expertise and training you need. Call SERVPRO of Palo Alto, 24/7 including holidays. 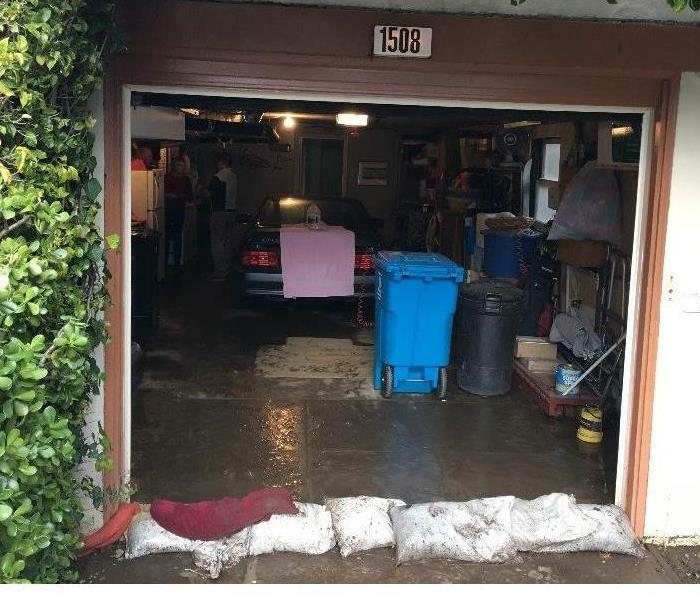 The crawlspace of this Redwood City apartment was flooded due to rainwater flooding the first floor. Our SERVPRO of Palo Alto techs arrived promptly to this call. Our trained specialists used our state-of-the-art equipment and quickly restored the property. We extracted the water, cleaned up the debris, sanitized and dried the area completely. The landlord of the apartment complex was extremely happy with the work provided by our specialists. SERVPRO of Palo Alto is dedicated in providing high quality service to our customers. If your home or business is impacted by storm damage, call SERVPRO of Palo Alto at (650) 800-3448. 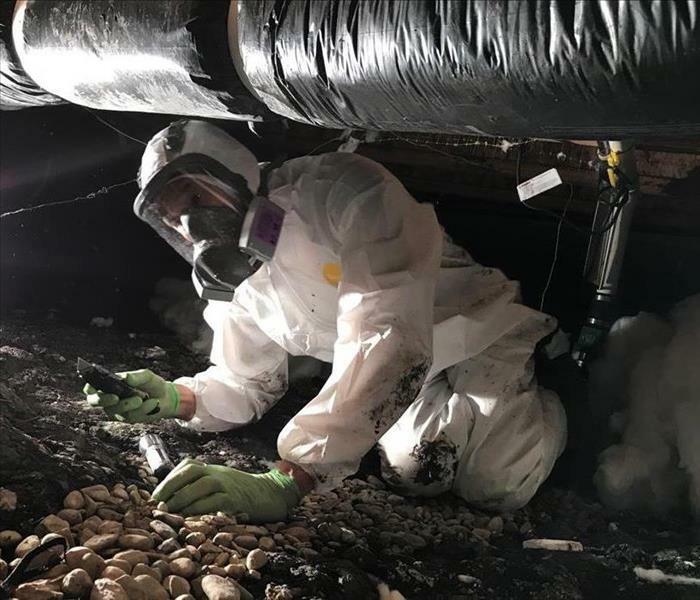 When a winter storm caused water damage and mold damage to this home in Redwood City, the homeowner trusted SERVPRO of Palo Alto with the job of mold mitigation. Mold damage mitigation in this home required the construction of a containment area. 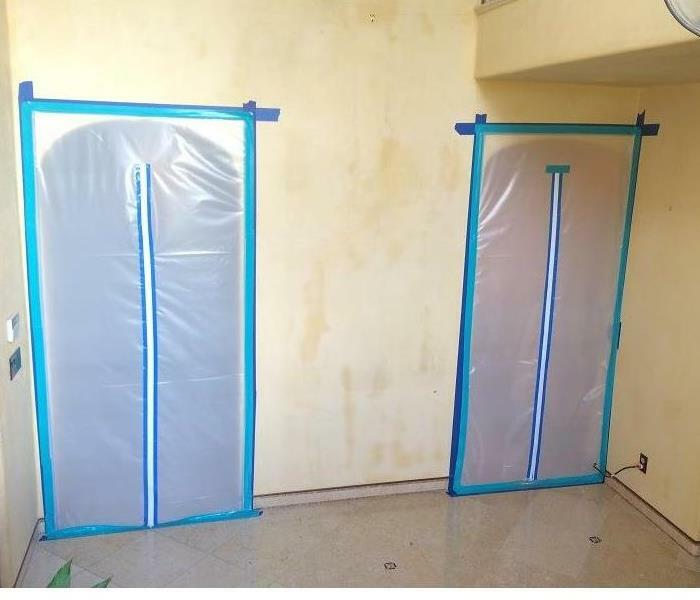 The containment method prevents mold spores from traveling throughout the residence. These containment areas allowed the family to live in the home while mold remediation was being completed. SERVPRO of Palo Alto techs do a great job at advising and explaining the process of mold removal. For any mold removal service or questions please call SERVPRO of Palo Alto at any time. 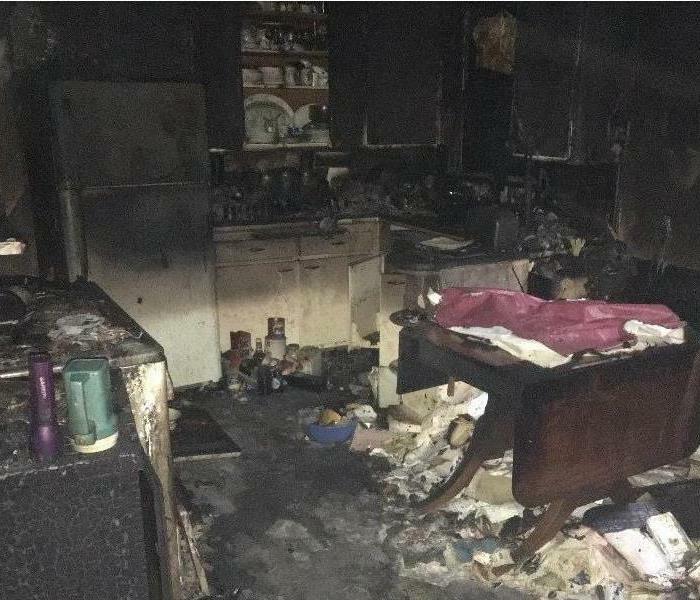 This home in Menlo Park was severely impacted by the faulty wiring of a kitchen appliance. This photo shows the severity of the fire damage. Like most fire victims, the family was at a loss, and didn’t know how to go about with fire restoration. Our SERVPRO of Palo Alto team did its best to consider the family’s needs and feelings, and began to restore their home as quickly as possible. Our crew took on the completion of restoring the entire kitchen, as well as performing extensive smoke removal throughout the rest of the home. Trust SERVPRO of Palo Alto for fire damage restoration to your home. Unfortunately, this home went up in flames, experiencing severe fire damage to the entire property. At SERVPRO of Palo Alto, we understand that restoring a home after a tragedy is a stressful time for the entire family. Luckily, in this case, no one was hurt. This project entailed many aspects of fire damage restoration. 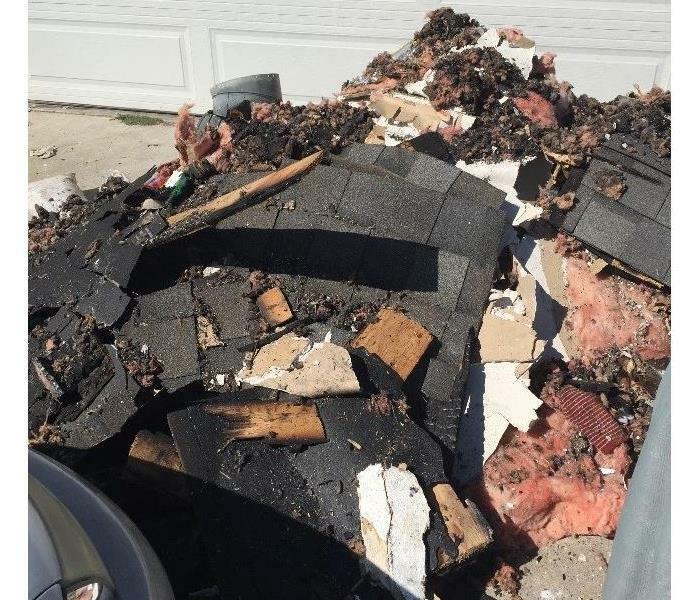 After sealing off the damaged areas of this house, our crew disposed of the demolished materials and set up generators to eliminate smoke odors. Our highly trained technicians utilized the proper equipment and expertise to quickly restore the damaged property in order for the family to return to their home. At the end of this fire restoration, our crew couldn’t help being delighted at the family’s tearful return to their newly restored home! 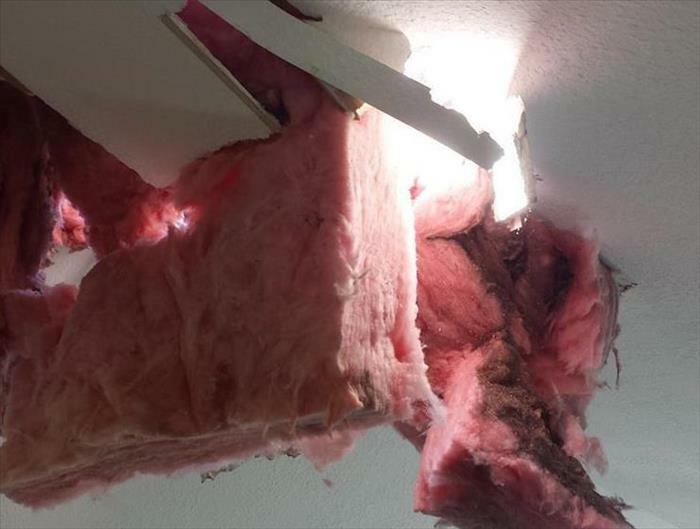 This picture is part of an apartment ceiling that had been torn off due to a rainstorm. SERVPRO of Palo Alto responded to the call and were there within an hour. Our technicians used temporary tarps on the roof to stop the water from entering the apartment. 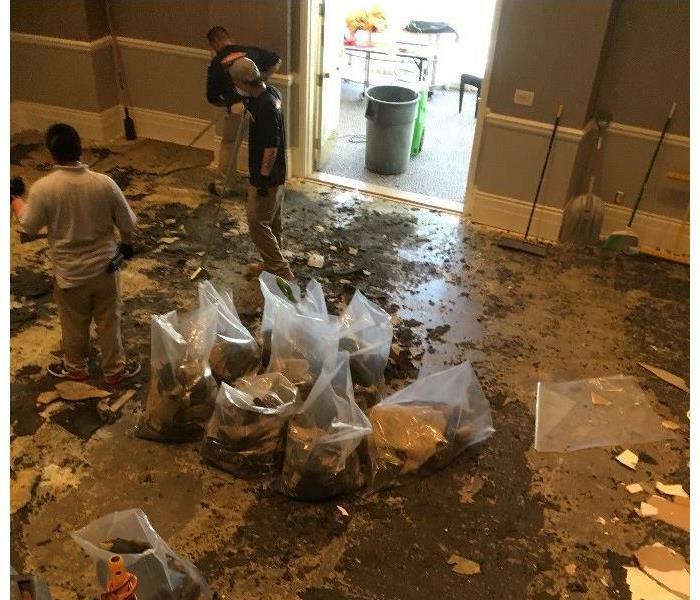 The next morning, after the storm, our highly trained technicians began the water damage restoration. Our crew removed all of the affected material, which included wet insulation and framing. All areas affected were thoroughly dried, cleaned, and disinfected in order to prevent microbial growth. 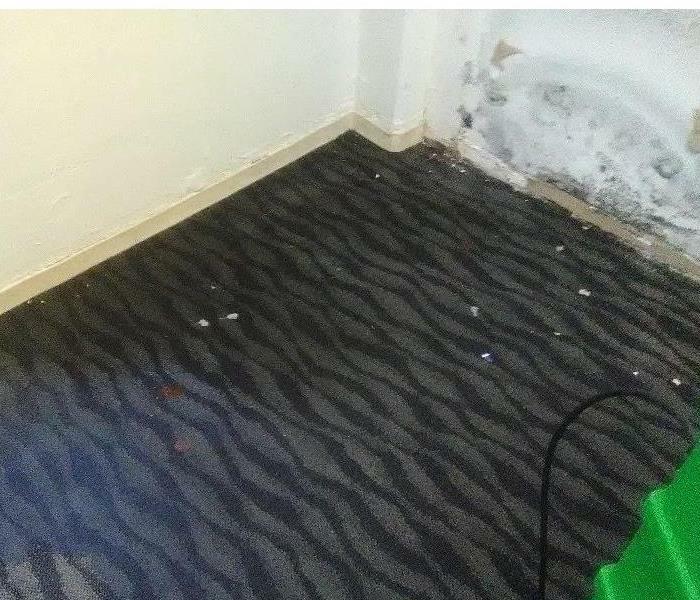 SERVPRO of Palo Alto was able to save the rest of the area from having to be replaced by drying it out properly in order to prevent further water damage. 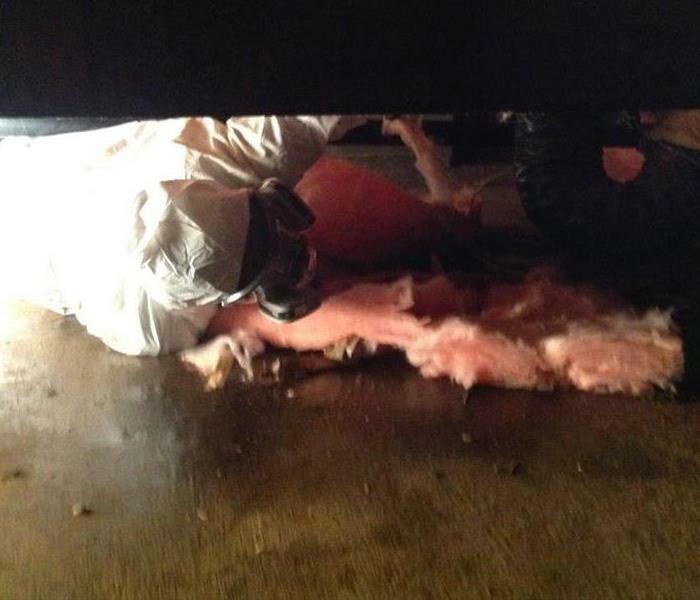 Our SERVPRO team hard at work cleaning up the water damage of a local beauty salon caused by a pipe burst. The water removal and cleanup process was completed by our specialists who quickly took care of the situation. Our specialists also used methods of deodorization to get rid of any odor caused by the water damage. The salon owner was extremely happy with the work and results provided by SERVPRO of Palo Alto. 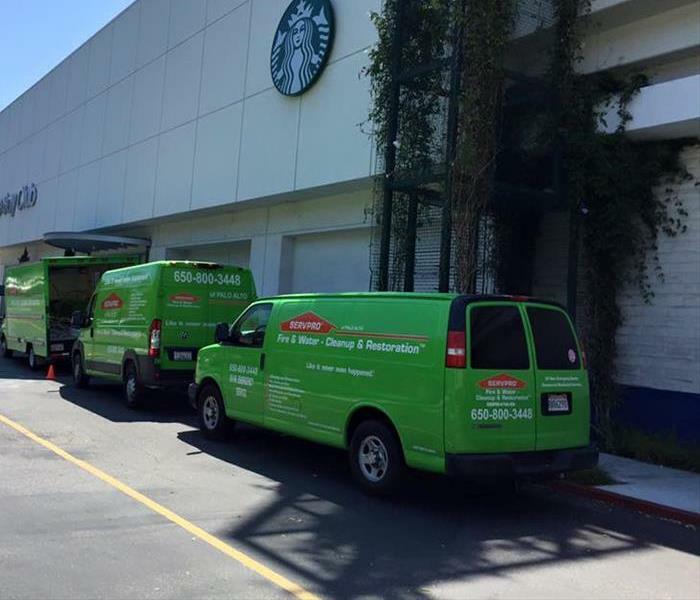 SERVPRO of Palo Alto performed a commercial water loss restoration project in a local mall in Cupertino. Multiple businesses were affected and our crews were working to the early morning hours cleaning up after this CAT 3 water back up. We were happy to do so because we know how important it is for businesses to get back to business ASAP. The management was very pleased with our speedy response and the results. Call SERVPRO of Palo Alto if your business suffers a water or fire disaster. Our heroes are here to help 24/7! 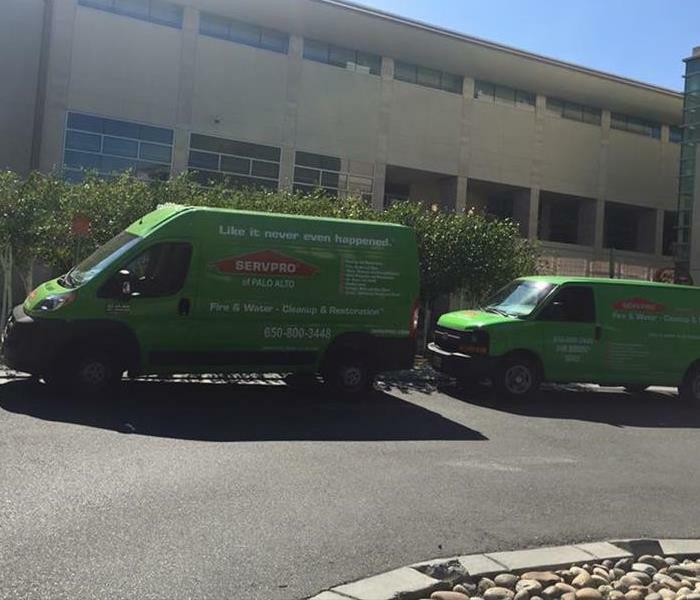 The water leak at this Senior Center happened over the weekend, but SERVPRO of Palo Alto responded fast and was able to provide emergency services, by extracting water from two neighboring units. Our crews installed dehumidifiers and air movers and started the drying process before any secondary damage could occur. If your residential complex has a water loss, SERVPRO of Palo Alto is here to help. We will respond faster to any size disaster and treat your residents with respect during the process. Call us at 650-800-3448. Our SERVPRO of Atherton/Redwood City professionals responded to a water damage caused by a broken pipe in an Elementary School. Our highly trained specialist removed the standing water with our state of the art equipment. After extracting the water, our technicians placed air scrubbers to purify the air and create a safe environment for the students to return to their classrooms. SERVPRO responded fast to this water loss that occurred while the homes were still in construction! Three units are 2 floors were affected due to a faulty plumbing install. Fortunately SERVPRO of Palo Alto responded within 1 hour to the call and installed drying equipment to mitigate any further damage. SERVPRO of Palo Alto doesn't mess around when it comes to drying your home as a result of rainwater damage, toilet overflow, washing machine busts, or pipe breaks. When a larger footprint of your home is affected (more than 2,000 sf) we bring in the big guns, like this desiccant. This high performance dehumidifier can remove 116 pints per day, which is double what a regular dehumidifier can remove. Desiccants are used in large homes and commercial water damage. Call us if you need to hire the professionals: 650-800-3448. Our heroes are here to help 24/7! SERVPRO of Palo Alto set up this major containment at this huge estate in Atherton.The purpose of this containment is to keep the water damaged area contained and keep the dust from drywall demo away from the unaffected areas. The homeowners were very pleased that we were able to contain the area correctly and efficiently. This resulted in faster drying time and less mess to clean up. This home in Atherton suffered from a water line leak in the crawlspace that resulted in mold forming. Our team quickly responded to remove wet insulation as well as mold remediation while wearing a protective suit for safety. For our technicians, safety always come first. Our highly trained technicians of SERVPRO of Palo Alto have the training, equipment, and expertise to resolve all water damage issues in residential and commercial properties. The HEPA 500 is one of our favorite pieces of equipment and is used on a number of categories of losses, including mold, fire and sewage jobs. This example is a category-3 sewage back up. It uses negative air and HEPA filter media to scrub the air with an efficiency rating of 99.7% to quickly and effectively maintain a clean and odor free air environment. On fire jobs, it helps to remove the smoke odor from the contents and structure with an addition of a tertiary carbon filter. On mold jobs it scrubs any airborne mold particulates. 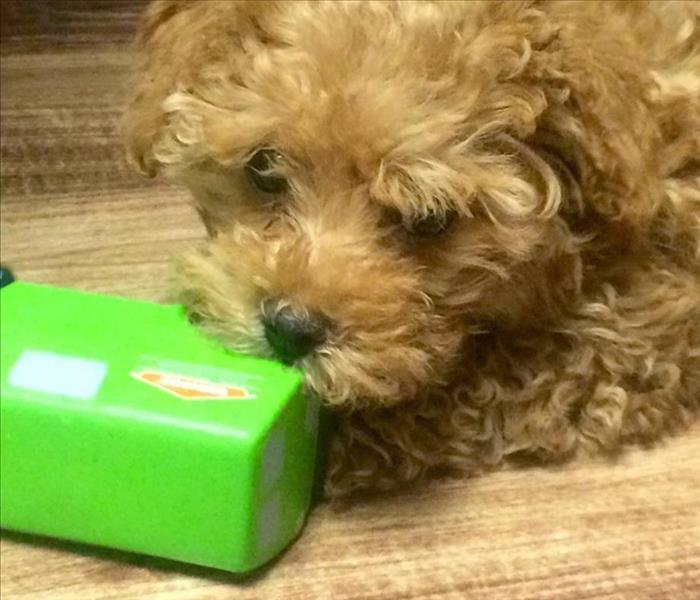 Let SERVPRO of Palo Alto remove your problem odor, call us if you need us: 650-800-3448. This water damage is a result of a rain storm that caused a leak in the roof of this luxury home in Atherton. The leaking roof caused severe damage to the hardwood floor causing it to buckle. The hardwood floor of this luxury home was no longer salvageable and had to be removed. Our SERVPRO of Palo Alto technicians used the tent method to force hot air into the wood and cement subfloor to speed up the drying process. For any storm damage in your property, SERVPRO of Palo Alto is dedicated to being faster than any size disaster. One of the many services we provide at SERVPRO of Palo Alto is pack-outs, storage, and content inventory. If you have to endure a water or fire damage, often you will be displaced or have to move some of your items in order for your home to be cleaned up or repaired. We offer pack-out and storage solutions while your home is getting back to normal. You can store on site at your property in a container or in our secured warehouse. We are happy to help you get through the process from dry-out to pack-out. Call us if you need us: 650-800-3448. Benny has been feverishly working on his marketing strategy, as he is coming out of training. Mostly he has been working on his licking, fetching and coming when called by his name. He is also a great watch dog and barks whenever anyone suspicious walks by.